These boxes, measuring 7 cms square and 4.25 cms high, are inspired by Swaledale, the dale in North Yorkshire where the Nutmeg Company is now located. 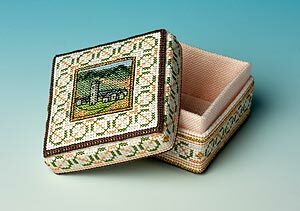 Each box represents one of the four seasons and has a tiny picture on the lid depicting a Dales village. Another scene is worked on the inside of the lid and wording is stitched around the inside of the lid rim - commenting on the season represented by the box. An alphabet is included in the instructions so you can work a personal message and date if you wish. Kits contain 16-count aida, evenweave for lining, wadding, stranded cotton, ultra stiff plastic canvas to form the box, needle, chart and full instructions. Swaledale turns gold and bronze as the year begins to draw to a close. This box has a brown base and delicate apricot lining.